OCN’s “Dubious Beer Expert” continues his tour of Hampton Roads breweries. Funky and artsy, the NEON District in downtown Norfolk provides the perfect setting for Bearded Bird Brewing. You’ll get a pre-taste of both when you park across the street from the Bird (on the corner of Starke and Granby streets), by one of the many enormous, funky, artsy building murals that define the District. 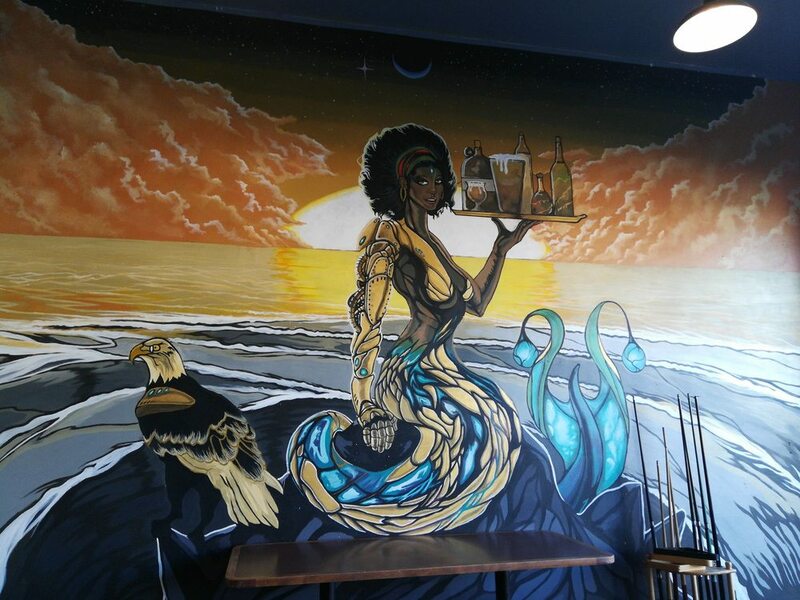 The graffiti-inspired paintings continue onto the inside walls of the nearly two-year-old “Home for Homebrewers,” Bearded Bird Brewing. 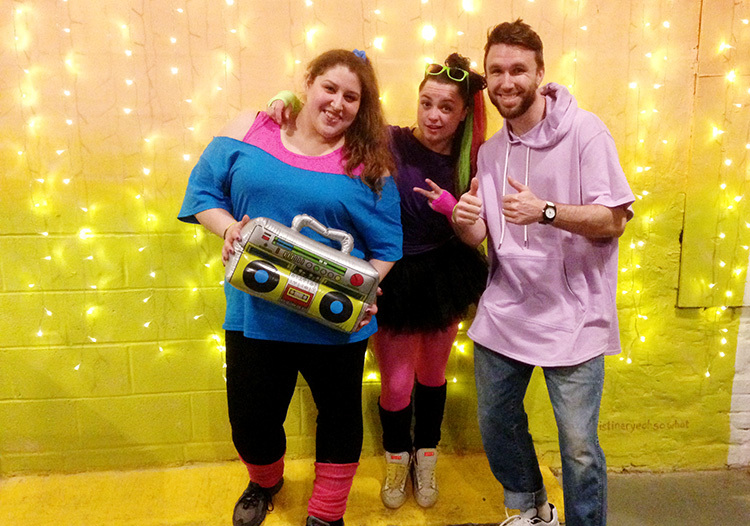 Tonight was '80s Night at the Bird, and the joint was jumpin'. Appropriately, "Funky Town" blasted from the PA speaker for the room crowded with patrons dressed for the occasion: ladies in pink spandex; scrunchied ponytails streaked with blue, red, and yellow; and dudes with headbands -- you know, the '80s. "Stop Making Sense." My visit to the Bird was not only to review some of the brews but to also attend a joint birthday party for one of my occasional Dubious Beer Tasters, Sam, who was there with her canine sidekick Skeeter (the Bearded Bird is dog-friendly). I recruited the other birthday honorees, Andrea and Michael, to help Sam and me opine on Brewmaster Brandon Spink’s handiwork, a flight of five samples served up by beer-tender Zoe. I found my birthday tasters at a table of about 20 millennials in the middle of a game of Red Flag. Games are big at the Bird – they have large chests stocked with an impressive selection of them. In addition, five hacky-sackers carried on in the outdoor tasting room. And around the Bird’s one pool table, a boisterous knot of birthday partyers passed party dog Skeeter around like a baby, much to the pooch’s delight. The Bird’s most recent creation, “O Morain,” an Irish Red ale, earned a “Woo! This has a fruitiness to it. Smooth,” from Michael. Andrea deemed it, “Very light. A good beer for a non-beer drinker to try.” I thought it very light as well, with a slight caramel finish. The journey into lightness continued with the “Ginja Ninja Honey Ginger” Saison ale. Andrea observed it had a lot of flavors. I could definitely appreciate the faint ginger twang had been smoothed by honey. Pressing on (a beer taster’s work is never done), I poured some “Port of Norfolk” Pilsner. Michael’s first-sip thoughts were, “More like a, I don’t know, a little hoppy.” Sam thought it had “kind of a grape flavor.” It was so light my taste buds couldn’t deliver any data to report. Man, I was ready for a beer with some meat on its bones. Fortunately, I had saved the “Imperial Decline” American stout for last. Another "Hats Off Brew Crew" collab, it got another “Woo!” rating from Michael, who added, “Very strong. Hint of coffee.” Sam found it a little bitter, while Andrea declared the delicious dark her favorite, as did I.
Co-owner Matt Hartl let me know the Bird is one of the sponsors and live music venues for the East Coast Music Conference 2019, going on throughout the downtown Norfolk area May 9-12. Sounds like a perfect event for the Bird. More info here. 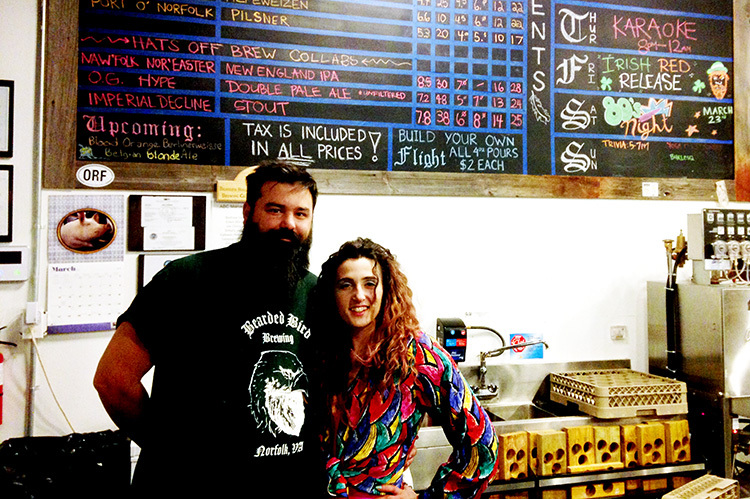 Bearded Bird Brewing is located at 727 Granby St., Norfolk, VA 23510. Their hours are 4 p.m.-10 p.m., Tuesday-Thursday; 3 p.m.-10 p.m., Friday; 11 a.m.-10 p.m., Saturday; 11 a.m.-7 p.m., Sunday; closed on Monday. Find more info on Bearded Bird Brewing’s beverages here. Microbreweries and their beers have really creative names. What’s the most creative name of a brewery or brew you’ve heard of? Tell us in the comments!